St. Jerome spent more than 30 years translating Holy Scripture into the Vulgate (Latin) so that the word of God could be accessible to ordinary folk. 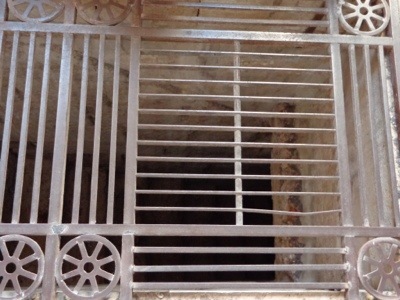 This is a photo of the gate leading down to the small cell where he worked (located at the Church of the Nativity in Bethlehem). The stark simplicity of these quarters invites us to reassess how much we really need in the way of material things in order to do the work God calls us to do. As I enter a new ministry with the poor and those on the margins, it serves as a strong reminder that little is required beyond the most basic necessities. Little is required beyond the power of the Holy Spirit and a willing heart. This entry was posted in Christianity, congregational development, Diocese of Florida, faith, Ministry, Uncategorized and tagged Christianity, Church of the Nativity, St. Jerome. Bookmark the permalink.